Of one thing I’m certain: each day that I’m given is more proof of how little I know. For me that was 7 months and 3 weeks ago. But now those days are over. Although I’ve always felt like I relied on God, I can tell you that this day, today, without a doubt, I desperately need His grace, His direction, His wisdom, combined with His mercy and goodness and provision, tossed in with a good handful of His forgiveness and a shake or two of second chances. Raising a child is hard. And I have a good one. She’s not difficult, really. Perhaps a touch stubborn and spirited. She doesn’t sleep like other mother’s claim their babies sleep. And she doesn’t eat like she’s supposed to. She’s adventurous and bold, she’s determined and serious. Sometimes she’s playful and occasionally you could even say she’s sweet. Each day I ask God to help me and to forgive me. If she has trouble sleeping, it’s because of me not her. I have 0%consistency in my day. Schedules are for trains. If she has trouble eating, I’ll take the blame on that too, although she’s the one with her lips clamped together. Through my hours upon hours of research, I’ve discovered there’s basically two camps of parenting. I’m no longer looking for advice, I’ve received enough. So really, you don’t need to give me any, but I will allow you to commiserate with me all you want! I’m just writing to air my frustrations, state my opinions, and talk out loud. Case in point. Sleep trainers suggest that I put her in her crib for naps and at bedtime when she’s drowsy but still awake. Not to rock her or nurse her, or give her any sleep crutches what so ever. After placing her in the crib drowsy, but awake, she is supposed to put herself to sleep. All on her own. This has actually happened a time or two when she was smaller. I can actually testify that when she’s in her appropriate window of sleepiness, as long as she’s not teething or gassy, when her diaper is dry, and her room is the correct temperature, as long as her nose isn’t stuffy or her socks aren’t too tight, and as long as the moon is in the second house, she will actually go to sleep. 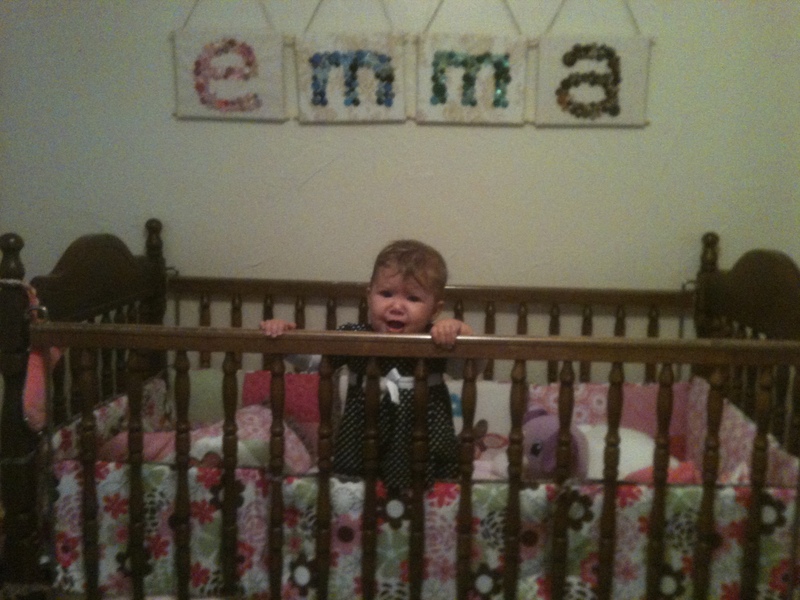 But most of the time, when I put her in her crib, I get this. Now, how can I tell her no and lay her back down, when for the last two weeks, I’ve been clapping and cheering every time she pulled herself up to standing? I’m at a crossroads. If I pick her up, then she won’t understand she’s supposed to lay down. And if I tell her,”no, lay down”, she won’t understand how proud I am of her for working so hard to stand up. During this sort of dilemma, my maternal instinct usually wins. The one that says love and comfort, hush her cries, make her feel safe and loved. I know I’m reinforcing undesirable habits, but I can only pray that I’m building trust and reassuring her that she needn’t worry about her needs being met. After giving this parenting gig a go for the last 8 months, I’ve come to some conclusions. I must figure what works best for my family. If the situation isn’t a problem to the family, then the family shouldn’t let society (or the internet) convince them it’s a problem. There’s really no right way to do this. Most other mothers must be liars, wanting others to believe they have dream babies, or it’s been so long ago, they’ve forgotten. I don’t have the answers and can only do my best. I’m going to mess up everyday and I can only hope she doesn’t turn out to be Jeffrey Dahmerish. Or worse. God bless all mothers, everywhere! Joe did not sleep in his crib for the first 6 months of his life, Angel. I slept on the couch with him and/or in the guest bedroom with him. 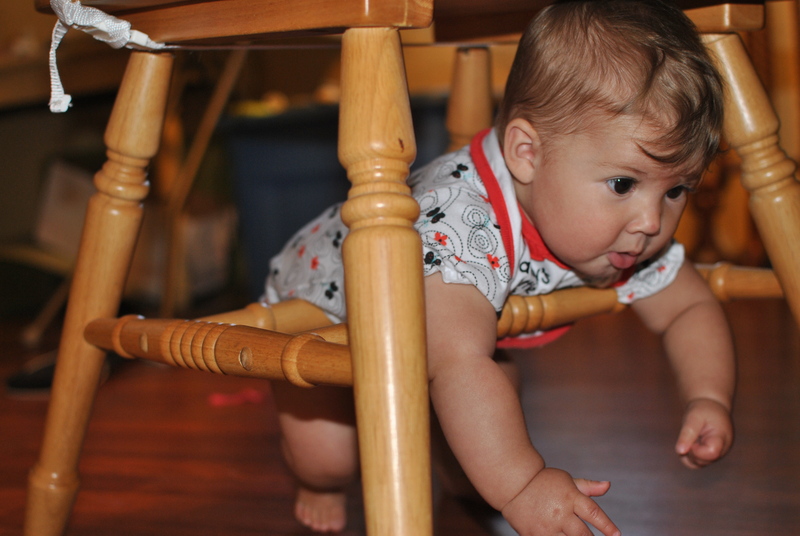 It was not until we took him to Rob’s parent’s house for the night (where he slept the entire night in their crib) that I was able to get him in his crib. I can still recite the commercials that aired between 2am – 4am, on the nights I slept on the couch with Joe. UGH. Charlie was easier, I think. But really – Joe was so challenging, The Hulk would have seemed easier to care for. Hang in there, Angel. And that picture is still one of my all time faves!! You do what’s best for you!! What feels right to you. I let Bryce cry it out to sleep. About killed me. Alec slept great, then it was all downhill from there. We’re still co-sleeping with Joshua. And that works for us. Most days. And I wanted to breastfeed them forever! Most of the time. Baby wearing was new with Joshy, but I wished I’d have found it sooner! Like when Jackson was tiny & I also had Emily, who was just barely walking. That baby is loved & she knows it. That’s all that matters for now. I remember other mothers telling me that their babies slept through the night by 2 months or some other early ridiculous age. I always thought wow, how nice for you and what am I doing wrong. I will honestly tell you Alli never slept good til she was 7 years old. ( I don’t say that to discourage you) She wanted to stay up late and was up by 6 at the latest. She hardly ever napped alone. If you got her to sleep and dared lay her down, up her head popped. So Dave and I use to fight over who could give her her nap, because who ever got her to sleep could also have a nap! And sleep was a very valuable commidity then! Then when she finally would sleep beyond 7 in the morning, which by the way seemed so late, we started over with Riley and we are still not sleeping well. I waited so long for my boys that I didn’t care about making them go to sleep by themselves in a crib. I wanted to hold them and rock them, so I did until they were about 2. It really is such a short time and they will eventually sleep on their own. I always rely on the ” they won’t go off to college being rocked to sleep or carrying a blanket or sucking a thumb” so you do what ever makes you both happy because once those days are gone you are going to miss them, I do. Angel, you only have to know that if you stick with the “Recipe” you offered (the one under that adorable picture (giggle) ..you will do just fine! With His guidance, and your love as her parents, she will be all she is supposed to be. I might add that I agree with Jerri 100% when she said “do what makes you both happy cause once those days are gone, you will miss them”… Amen to that, sister!! Even now in my “golden years” I find myself longing for (and treasuring) those memories of my babies’ early days. Another reason that this site is so special is that Emma will have all this to look back on and know how much you both loved her, much like how you feel when you read your Dad’s words, I’m sure. You’re the best, kiddo … until next time Donna H.